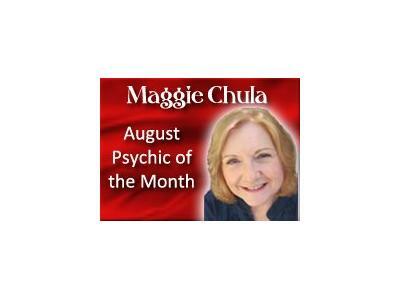 Free Psychic Readings with Maggie Chula!! Maggie Chula. is a professional psychic, spiritual counselor and energy healing facilitator. She has been named the psychic of the month for August 2012 by Shay Parker’s Best American Psychics. She is also a member of Shay Parker’s Best American Healers, an Om Times Psychic, and has passed the testing process to be certified as a professional psychic through the Global Psychic Solutions group. On August 10th her new radio show Soul Essence will debut on the Om Radio Network located on New Sky Radio. Her show will be on each Friday from 10 PM EST to 11 PM EST. She recently completed channeling and co creating a new class with her Akashic Counsel of Light Beings. The class is called the Akashic Vibration Process and has been developed to help teach a process anyone can use to develop their connection to their higher wisdom or soul self. Additional benefits of the class for the student include strengthening intuitive skills, opening psychic awareness and learning how to work with their own counsel of light beings within the Akashic Vibration. All counsels include Arch Angels, Ascended Masters, Guides and Guardians of the Akasha as well as Loved Ones who are in Spirit. Students will learn many ways to attain the Akashic Vibration and work with the tools within the Akasha which include the Akashic Records, the Flame of Transmutation, the Emerald Looking Glass and the Hall of Records. Maggie’s passion is to help every student and client who is drawn to her work open up to their higher wisdom and guidance in the hope that with the expanded awareness of their true Divine nature they will be able to co create their life with love and compassion for all life on Earth.